According to reliable source, Intel is going to collaborate with OLPC (One Laptop Per Child) for the new development of the low-cost laptop computer targeting for children in developing countries. 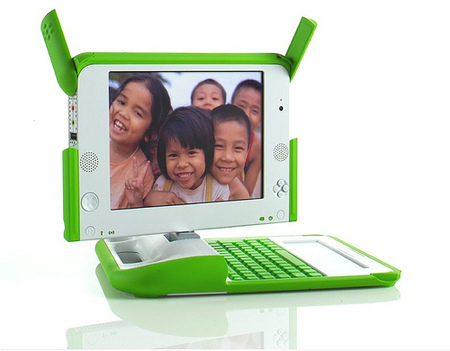 OLPC is a non-profitable organization based in US that will coordinate the whole design and manufacturing of these low end laptops. Current version of the laptop known as XO-1 is using AMD’s Geode microprocessor running at 433MHz. With the announcement, it also means that Intel will start a new development of the low cost design from scratch and is believed to use either Celeron M or Silverthorne which falls in similar product’ price range as per AMD’s Geode processor. The XO-1 or sometimes known as $100 will focus on low cost and power, small size but yet reliable which is intended for children in developing countries to have access knowledge base through internet access. Similar to Geode LX-700, Silverthorne processor is famous for its low power dissipation, fan-less design and small package size suitable for embedded market. It has a low BOM (Bill Of Material) cost and can fit well at around $100 target price, even with all the chipset and peripherals accounted in. Besides, it poses a great advantage of smaller process technology of 45-nanometer over AMD’s Geode processor which can help to bring down the whole final product’s size and promote better heat dissipation. Apart from Intel and AMD, OLPC is also looking for opportunities to work with Marvell Technology to utilize its Xscale based processor in this low end PC market. Whichever choice that they have made, it would definitely benefit all the poor children across the region with high end technology built into the design.